Explore the Madrid’s top sights on this 2.5-hour sightseeing tour. Traveling by air-conditioned coach, admire showstopper attractions such as the Royal Palace of Madrid, Alcalá Gate (Puerta de Alcalá) and Cybele's Fountain (Fuente de la Cibeles). Cruise along beautiful boulevards to the ancient city squares of Plaza Mayor and Plaza de la Villa. Discover diverse districts such as the Barrio de la Morería, and learn of their history from your guide. This morning or afternoon tour is perfect for first-time visitors as it offers a well-rounded introduction to the city's sights. 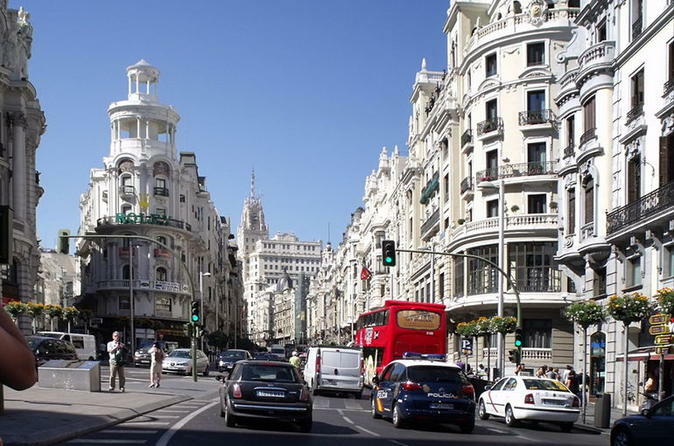 Madrid shows the multiple contrasts inherited through History. Elegant squares such as Plaza de Oriente, Plaza de España, Parque del Oeste, Príncipe Pío, el Puente del Rey, la Ermita de la Virgen del Puerto, ending at Segovia’s Bridge - Puente de Segovia, one of the best viewpoints of the Royal Palace and the Cathedral of Almudena. We will continue to Puerta de Toledo, Plaza de la Villa, Plaza Mayor, Puerta del Sol, Las Cortes, Plaza de Neptuno, Atocha, Paseo del Prado, Puerta de Alcalá, Alcalá street, the Retiro’s Park and Las Ventas Bullring, plenty of cheers and colors in the afternoons of bullfight. We will return to the city center through Plaza de Colón. We will continue towards the new Madrid, with its modern buildings, gardens, its great avenue Paseo de la Castellana, until Plaza de Castilla (Europe’s Gate) and we’ll go down towards Santiago Bernabéu Stadium, Plaza de Cibeles, Gran Via and Plaza del Callao, to end at Plaza de Isabel II (in front of Royal Opera House). The tour includes a free drink by courtesy of our partnership with Hard Rock Cafe.